What's more impressive than having a successful Kickstarter campaign to impress the Shark Tank Investors? How about complete two within 6 months and raise at least double your goal in each successful campaign. 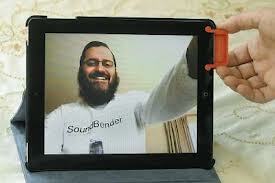 That's exactly what Moshe Weiss, a rabbi from St Paul, MN.and the Inventor of the SoundBender for iPads did. The Sound Bender is powerless iPad accessory that amplifies the sound by several times. You just connect the power bender to any iPad device with built-in magnet's and it bends noise from the back and directly amplifies to the front for a dramatic increase in sound. Now why didn't Steve Job's think of that? Moshe Weiss has been on a crash course in the past year to bring the Sound Bender to market. Along with this bumpy and accelerated path, Weiss has learned some valuable business lessons that have finally led him to the biggest Angel Investing Panel in the entire country, The Shark Tank Show. Having two successful Kickstarter campaign's may of what got him here, but the story actually begins in late 2011 when his first attempt at a campaign didn't meet its goal to fund Sound Bender. When Apple started releasing the iPad 2 & 3, Weiss needed to come up with a new design to accommodate it's sleeker style. He decided to use the Kickstarter route once again to get the much needed funds to have the new Sound Bender produced. Kickstarter campaign #3 started on June 19, 2012 and successfully completed August 18th with 544 backers and over $8,600.00 in start-up capital. The new Sound Bender's also fixed the magnet problem by enabling you to easily take out and replace the magnets. Weiss also came up with a brand new video that was shot more like a commercial but seemed to have a more lasting impression, at least to me anyway. Unfortunately this campaign also came with its growing pains as Moshe started getting orders from around the world. With each having its own custom mailing laws, Weiss was buried in paperwork getting some orders processed and sent out. This business problem lead to another valuable lesson needing to be dealt with for Weiss honoring his part of the crowdfunding deal. Now all of these experiences in a short amount of time have the potential to pay off in a BIG way this Friday Night on the Shark Tank Show. Moshe Weiss has already managed to get the Sound Bender in 350 Walgreen Stores around the country with more soon to be added. This type of distribution is usually music to the Sharks ears. Weiss recently was quoted saying he has so far sold more than 10,000 units at that time. What has me baffled on this particular product is the lack of online presence Weiss has chosen not to pursue when millions of people see the Sound Bender for the first time. The SimplyAmazinc.com website is as simple of a 3-page site and no way of ordering the Sound Bender directly. It does have a phone number 952-951-8434 which maybe a way of buying the Sound Bender directly but that doesn't make much sense (or dollars) in this day and age. Especially if 10,000 people all try to call at the same time. Instead, the site refers you to either Amazon or EBay to buy it online. "Please contact us with your specific requests, including interest in becoming an Authorized Reseller." Unfortunately for Weiss, the Shark Tank Show is on Friday Night, the day he observes the Sabbath and will be unable to watch the Show when he's seen by millions of people. No doubt he will watch it Saturday Morning for sure. Moshe Weiss came into the Shark Tank requesting a $54k investment for 26% of the Soundbender business. I'm not exactly sure where these numbers came from but it had a few Sharks scrambling to figure out the valuation. If you don't want to be eaten by a Shark the best thing to do is make Friends very, very fast. That's exactly what Moshe did with his very likable personality. He had them all laughing and having fun, and at the same time, slowly reeling in a giant Shark for this simple invention. In fact, he even makes a joke about how simple it is. But this simple invention has HUGE margins and that's music to the Sharks ears. Weiss defends his high margins by saying" Hey a rabbi's got to eat too, right?". He says it cost about a dollar to make the Sound Bender (without the packaging) and retails for $12.99 each. Yes, that's indeed very large margins and well above the average of 4 times the cost the Sharks are used to seeing. So far, Weiss has sold 7000 Sound Benders in just the past 6 months mostly to the online distributors mentioned above. With such high margins, why not also sell them directly to the consumer? This is a great way to sell in large quantities and maximize your profits while sharing the wealth with online marketers. He also happens to mention Walgreen's has a strong interest in caring this product on a national level. Barbara Corcoran asks Weiss a question all Angel Investors want to know, and he comes up with the Very Best Answer anyone could ever come up with. Barbara wants to know how she would get her money back from this invention. Moshe responds "I will write you a check." Right answer! Daymond John is the first to make an offer of 40% of the business for the $54k Moshe is seeking if indeed a Walgreen's deal can be completed. Robert Herjevic makes the same offer but will take Moshe's word the Walgreen's deal is real. He is given 10 seconds to make up his mind. Daymond John makes a Deal with Moshe Weiss and the Sound Bender Business! isn't it dangerous to have magnets near your computer? They need to be really strong to have harmful effects on modern computers. saturday morning is still the sabbath... sabbath is sundown on friday until sundown on saturday. not sure it would work with many of the IPad covers out there. The iPad covers attach with magnets. It's dangerous to put a magnet near a hard disk drive, a crt panel, or a floppy disk drive... neither of which are contained in a modern tablet. No damage to an ipad. I really think this is a great product that should be everywhere! I'm going to totally buy one. The Jewish Shabbat begins Friday at sundown and ends SATURDAY NIGHT when three stars are visible in the sky. NO DOUBT he would never watch it Saturday morning, he'd be in Temple praying! Isn't this pretty much the same thing as the tabAMP they sell on Amazon without the magnets? Are the two made by the same person? If not, then I'm guessing there may be a patent infringement here. Bought one (red) after the Shark Tank aired and been using it for 2 days non stop. It's perfect! I bought it off his website and it got to me in 3 days. Now I wish I would have ordered the 5 pack just to give to friends :-) For now I will enjoy. OH and it works perfect with most covers. Because most covers don't cover the speaker! Will it work with a Kindle pad? Thanks so much for the EarJell mention! If you like Soundbender - You'll LOVE EarJell. In December of 2011, I discovered that not only my family was doing it but LOTS of people were and still are using their hand to enhance and increase the sound on an iPad. A month later I began working on a model and after many design changes, I was able to create something that works for LOTS of mobile devices - EarJell! What's unique about EarJell is that it works with many mobile devices and addresses a prevalent problem for more than just iPad users. does it work on he IPAD mini? This Soundbender works! I just got home from school and I just got in the mail. Long story short, I love it! The sound is so much better and I would totally tell my friends about it. Will the SoundBender work with Ipad 1? Does the Sound Bender work on the Ipad mini? Hey guys I just got the SoundBender in the mail its not to compare to similar items. I'd advise you to buy it its not cost effective & works awesome! This sounds great! Will try to check this one out as well. Thanks for the great info. i ordered one for my grandson's ipad, but it will not work with an otter case on it. so was a waste of money for me.wish i had known the ipad can't be in a case. That is my problem too...I have an Otter case and will always have one on my ipad......can you design one to work with my generation 4 ipad with an otter case???? How about one for tvs with bottom speakers!